The ARC FX Gauntlet is a wrist-mounted disc shooter - using old-style foam discs (of considerable thickness), not Vortex discs. That doesn't mean it lacks usefulness, however. For the original review, click HERE. With an increase in voltage and a tad bit of internal changes, you can get 40-50 ft. ranges. The discs do curve to the right, but they do so in a relatively predictable manner, allowing the user some control by aiming to the left and/or tilting your arm slightly to the left. Modifications and results are similar to that of my modified Captain America Disc Launching Shield. 6 screws hold the top and bottom halves together. 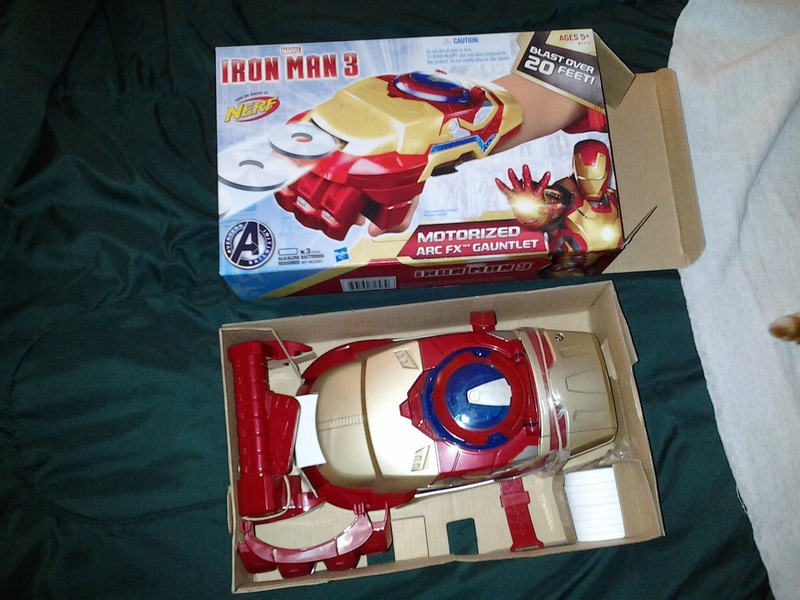 Upon opening, we see that the mechanism is exactly the same as that in the Captain America shield, albeit in slightly smaller proportions. Here's a closer look at the flinging arm and the motor, with a disc present for comparison. The motor is on the right, spinning the white flywheel. 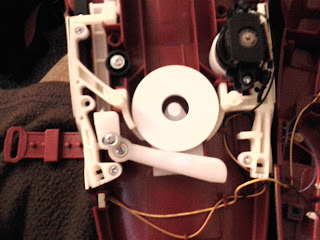 Pressing the large swivel trigger on the hand grip moves one white piece of plastic, and through a few pieces connected and pushing on each other, the throwing arm goes forward. At this stage, I took out the two screws holding down the motor. 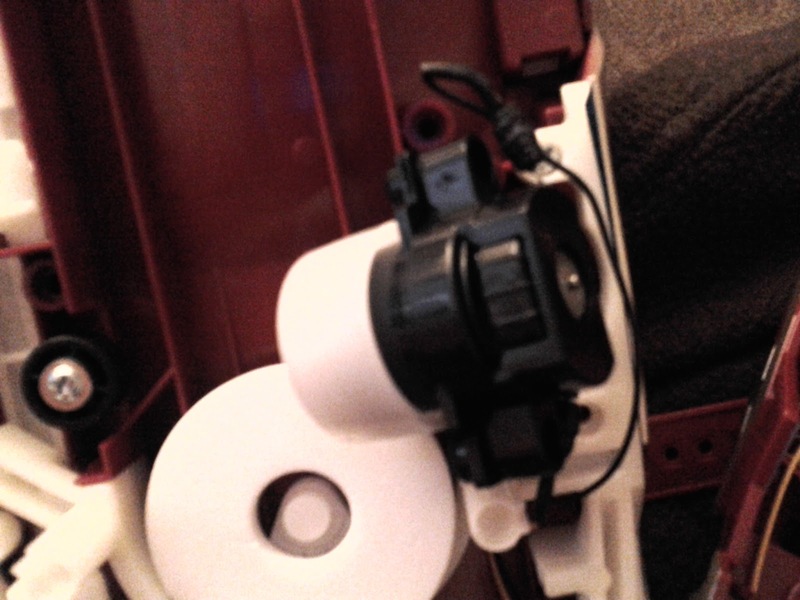 There's enough clearance in the shell for wrapping the flywheel in one or two lengths of electrical tape. I chose to only use one, and I made sure it was done as straight and even as possible. While this isn't a high-speed centrifuge by any means, I tried to make the one wrap as perfect as possible, to keep the flywheel balanced. 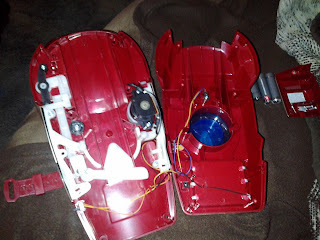 At this point, I reassembled the blaster, then took off the battery cover. I decided that I wanted the choice between 3 AA batteries (be they standard alkaline or rechargeable batteries) and a 9V battery. 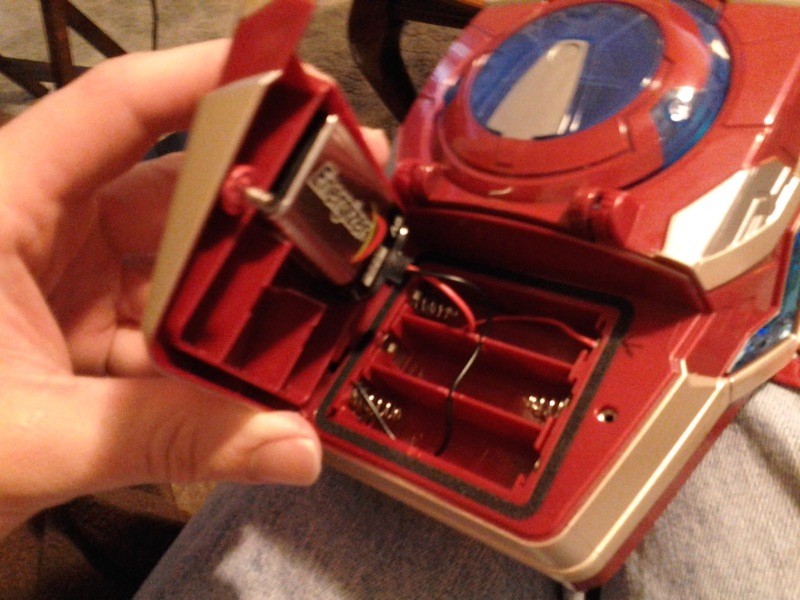 Seeing as the battery door is quite spacious, I cut out slots inside the door shell large enough to house the 9V. I also slipped the wires of a spare 9V snap connector behind the first and last contact plates in the battery tray - you can pry the plates out just enough to slip a good deal of wire between the plates and the shell. No soldering needed. 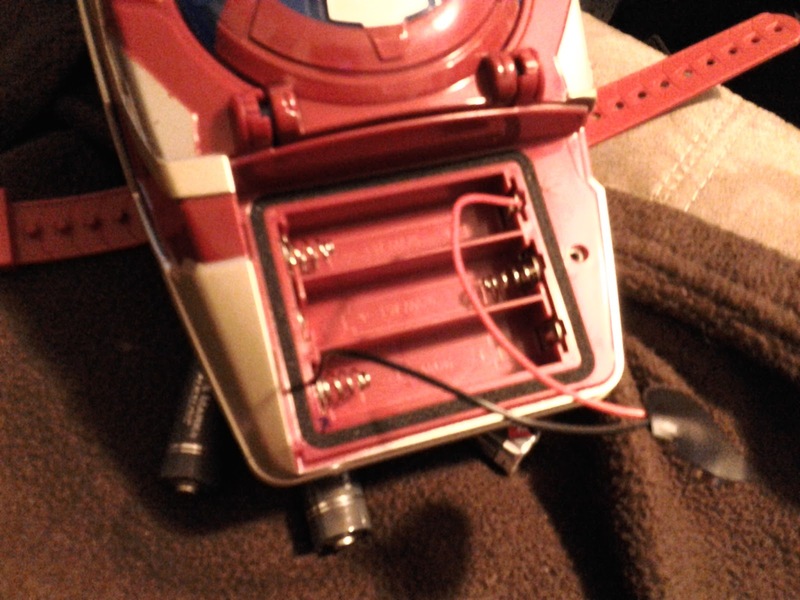 I also made a few tiny slots in the battery tray for the negative terminal wire, so that it wouldn't be pinched anywhere. Note that the basement is cluttered enough that the first 30 feet or so in front of me is a smallish corridor for firing a blaster. With that in mind, it seems you can at least aim the blaster for a straight shot for at least that distance before the curving to the right becomes a significant factor. This is definitely a novelty blaster, but you can still do enough to have some fun with it. Also keep in mind that there's plenty of space for internal replacement with air tanks and such, should you decide you want something with more punch. It's also been suggested that, given the 2" size of the discs, you could theoretically fill in 1/2" of space on the dummy wheel side, raise the height of the disc "barrel", and convert this into a wrist-mounted Vortex blaster. I'm not sure if I want to try that, but others are more than free to experiment! XCESS Revolvers now at ToysRUs! Gun Control Sweeps Carnegie Mellon University? Late to the Game, NBC? X-Shot Xcess Blasters Coming Stateside? New Air Zone Blasters Spotted!